Oliver in Spain: Today’s the Day! It is finally September 2nd! 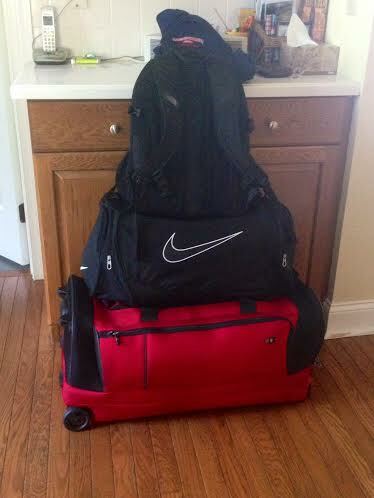 In less than 12 hours I will be boarding my flight at JFK and beginning my adventure. I spent all day yesterday packing so I think I’m ready to go, other than small tasks like shaving my face in preparation for the 4 month beard that I’m shooting for (we’ll see how long that lasts). There is really nothing like the day of your flight though. My closet is completely empty, my room feels stripped, and there is a nagging feeling of apprehension. I’ve been traveling all my life, thanks to my English parents, but living somewhere new by myself is a different sensation. The excitement is unparalleled. But with that excitement comes a whole lot of nerves. How will I survive with speaking Spanish 24/7? Will I be able to make new friends quickly? Will I lose some friends from UR because I won’t see them for 8 months (including summer)? I have all these questions running through my head and I have been doing well taking it day by day. But now they are all crashing down on me because I don’t have any more days to spare. But I am ready. It is as simple as that. Even with hundreds of questions swirling through my mind and subconsciously speaking to myself in Spanish while taking a shower, I am mentally prepared for this trip. Everything has fallen into place thus far and I am confident it will continue to do so in the coming weeks with classes and what not. My plane will land in Valencia at 1 and I will then take a bus to the Valencia Soccer Stadium with the program, where I will meet my host family. Step by step, I will get accustomed to living in Valencia. After all, that’s my new home for the next four months. 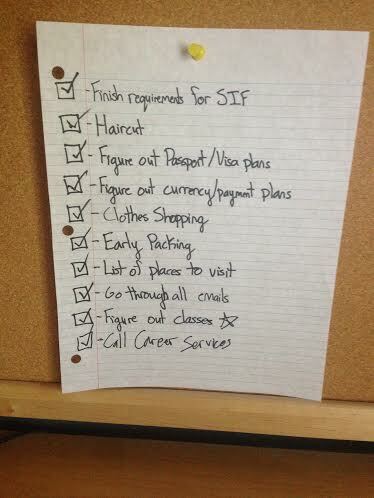 With this checklist completed, I feel ready to take on my semester abroad! This semester will be like nothing I have ever experienced. I will be pushed out of my comfort zone and thrown into a situation with almost no one I know. I will miss spending a semester with my friends at Richmond, but who could pass up on going to school in Spain and traveling to new countries every other weekend. This is going to be a crazy ride and I am about ready to buckle up! My next post will be from Valencia! I should have a bunch of pictures for that one. Until then, wish me a safe flight!